Here are three surprisingly simple ways to streamline your creative process and increase the impact of your presentations. 1. Don’t Start by Writing your Opening! This “action goal” should come at the very end of your presentation—right after you restate your key message. And everything that comes before should lead directly to this goal. Your “action goal” becomes a litmus test for what information you include your presentation. If it supports your action goal, it goes in. If it doesn’t, you leave it out. That’s why you need to start at the end and work backwards. To make sure you are leading your audience towards the ultimate action you want them to take. 2. Don’t Start With Your Slides! We’ve all done it. We have a week to pull together a new presentation, and we immediately go back to our old decks, pulling a slide here, a slide there, thinking it will save us precious time. But don’t do it. Avoid the siren cry of our old slides wailing to be used again! This is because every audience deserves our best thinking. And if we’re utilizing our left brain too heavily—the one that’s trying to match styles and fonts—then our right brain—the part that should be creatively thinking about how to engage and inspire the audience - takes a back seat in the proceedings. Here’s another reason. Starting with slides locks us into a box and a way of thinking that is not easy to escape, even if it’s taking us down the wrong path. We can end up being a prisoner to our slides instead of having our slides work for us. Next time you have to craft a presentation, give your right brain a chance to sit in the driver’s seat. Try opening up Word instead. Sit with that blinking cursor and think about what your audience really needs to hear to sign on to your goals. Or better yet, move away from your computer entirely and go old school with a yellow legal pad and a pen. You’ll end up with a better presentation for it. 3. Don’t project your handouts! If the next time you went to watch your favorite Netflix show, all you saw was the director’s script on your TV screen, would you enjoy it? Yet that’s what we do to audiences all the time when we present what should actually be our handouts. 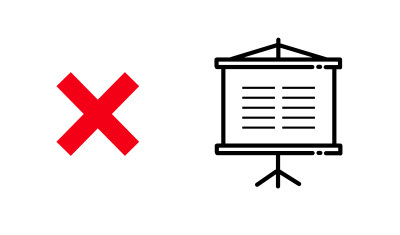 Great slides don’t repeat what we’re saying, they should enhance our narrative with evocative visuals and minimal words. The experience of watching a presentation should be more like watching a play or movie than reading a document. So take your bullets, charts and data points and put them into handouts that you can give to your audience at the right time. When it comes to what you’re projecting, try to communicate with images not words - and only add words and data when absolutely necessary.